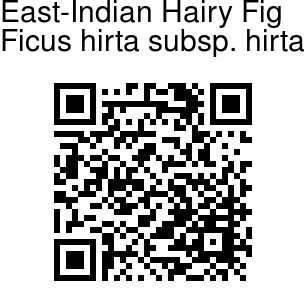 East-Indian Hairy Fig is a shrub or tree up to 15 m tall. internal hairs are abundant to sparse, whitish. Leaves are alternate, variable, broadly ovate, somewhat-round or ovate-elliptic, 3-5 lobed, hairless, base rounded or heart-shaped, margin entire, tip tapering to pointed, lateral veins 4-7 on either half of midvein. leaf-stalk 1-7 cm, brown hairy, stipules red, ovate-lanceshaped, tapering. 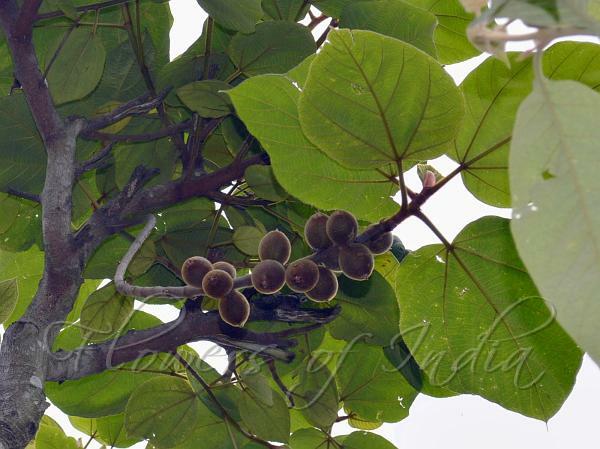 Figs are borne in leaf-axils on normal leafy branchlets, paired, spherical with golden yellow or brown hairs, apical pore navel-like when young, stalkless, involucral bracts falling off, ovate-lanceshaped, tip pointed. East-Indian Hairy Fig is found in E. Himalayas, from Nepal to NE India, Burma, S. China, Indo-China, Malaysia, at altitudes of 900 m.
Identification credit: J. V. Sudhakar Photographed in Gopaldhara, Darjeeling, West Bengal.